I don't think I'm alone in saying that throughout the colder months I typically gravitate towards darker colours, I don't know what it is, maybe the darker mornings and colder days make colour a thing of the past. This season there's something different though, blush pink is everywhere! Usually a colour saved for the spring sunshine; surprisingly this season it has made an appearance much earlier than usual and I'm definitely not one to complain that's for sure. Picking up blush pink pieces has made it much easier for me to add colour to my autumn wardrobe, there's not a single piece of black in this outfit - who'd have thought?! I'm wearing my first ever pair of Farleigh jeans, I think they're almost 2 years old now but I still love them (albeit they're definitely a size too big for me now and looking a little worse for wear!) 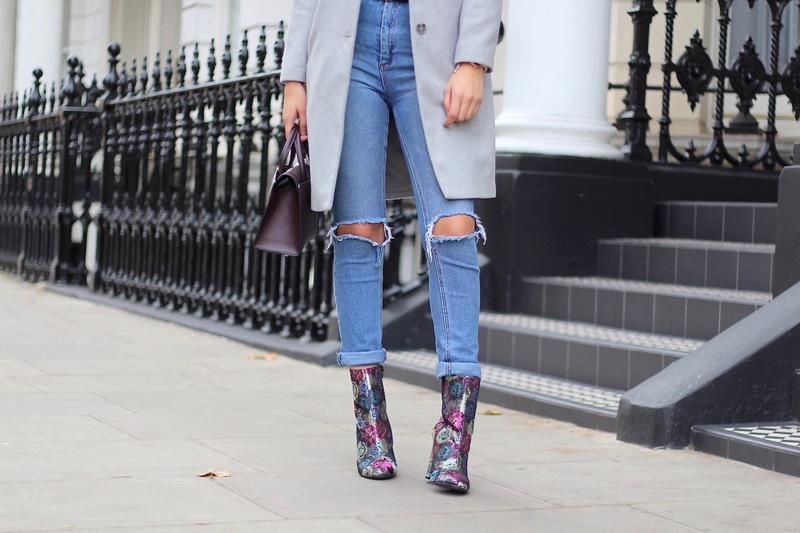 paired with a grey coat from New Look and an incredible pair of floral print boots from Dune which I bloody love! I thought these boots would be a risky piece to add to my wardrobe but they just work with everything believe it or not. I love this outfit, you always look so well put together! The boots are to die for.